NetEnt is set to launch an industry-first product within live casino. Perfect Blackjack really does live up to its name. It is a brand-new live casino game that allows players to be dealt cards according to the perfect blackjack strategy, which cuts the house edge down to 0.5 percent and delivers a return to player (RTP) of 99.5 percent. 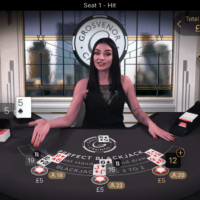 “Perfect Blackjack truly is an industry-first for live casino, and we are certain that this game will appeal to all levels of players. Whether you’re a seasoned player wanting to sit back whilst being dealt flawlessly, or if you’re a beginner who wants an intro to blackjack and its strategy”Andres Rengifo, Director of NetEnt Live.